It's a little odd to realize it's been seven whole years since I was last pregnant. Sanders turned 7 yesterday on March 2. He was SO excited to reach this milestone. Me? I'm still processing it. 7 years is old. 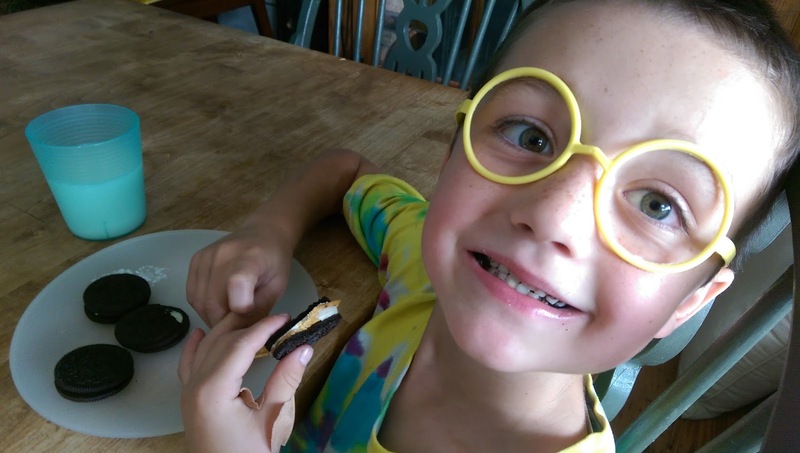 6 is still little, but a seven year old really feels more like a big kid than a little kid. Even though they are still little. It's quite the paradox. 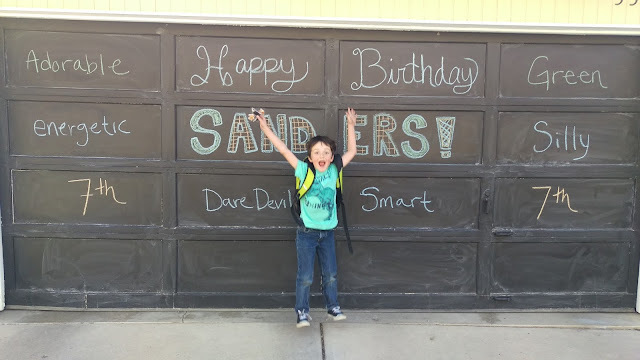 Sanders only wanted two things for his birthday. A fish and a pokemon binder. My sister had a 10 gallon fish tank she wasn't currently using and said we could use it for as long as we'd like! 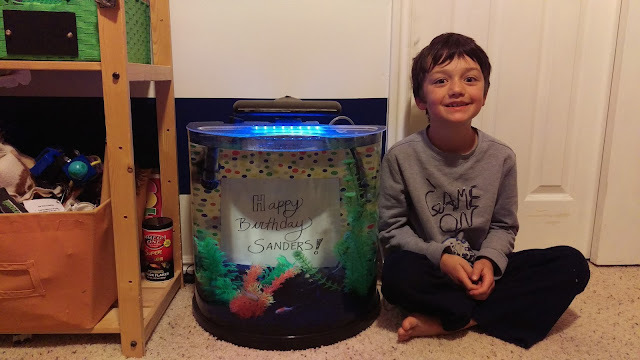 We took her up on that generous offer and set about setting that fish tank up in his room when Sanders went to sleep on his last night of being a six year old. The tank is bigger than a small fish bowl so we got him 8 fish. 5 neons, two gold fish, and one dalmation molly. The set up went smoothly without a single stir from the birthday boy. I knew it would most likely happen, but it was even better when it did. He woke up in the middle of the night to use the bathroom. 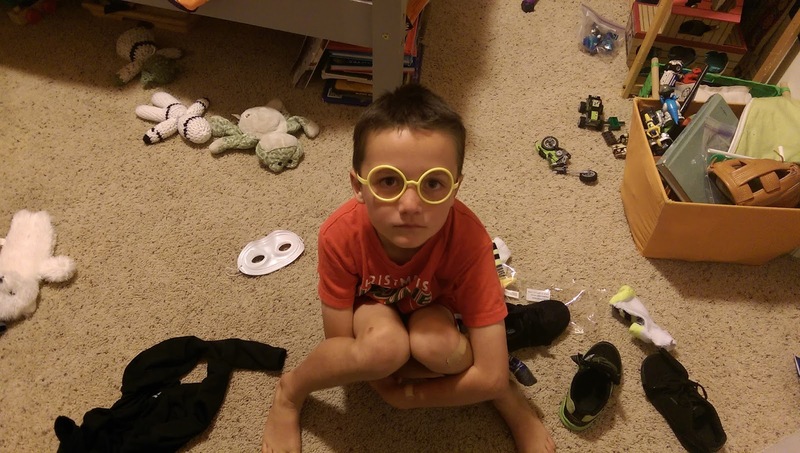 I didn't hear him say anything, so when he returned to his room I went in to check on him. He said, "I just had to use the bathroom." "...I saw my fish," he said with a sly little grin. He got out of his bed and we laid on our bellies (the tank is currently on the ground) and talked about all the fish in there while we enjoyed each other's company. It was magical. 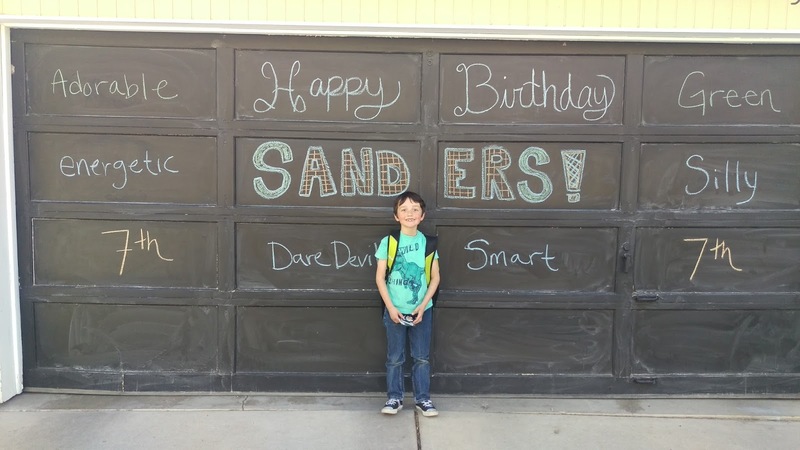 Sanders is a bit stubborn, bossy, and moody at this stage in his life, along with a slew of good qualities, but you know, sometimes they go through these not so awesome phases. It was pure heaven to be reminded of his true personality in those quiet moments in the middle of the night. Sanders is inquisitive and truly finds joy in the little things. He's very intelligent and remembers and seeks information just like his dad and his brothers. He gets his silliness from me though. I'll claim that trait any day of the week. He is a dare devil and loves all big, fast rides. He can't get enough of them. It's the best that he's finally reached the height that he mostly likely will not be turned away from any ride. Pokemon are life right now. His friends come over and they trade and barter. It's a good life lesson on making sure you get the value you want before you agree to give up something you love. I got to go to his school and pass out his requested treats, green sprinkle doughnuts.Thank goodness his birthday is in March! 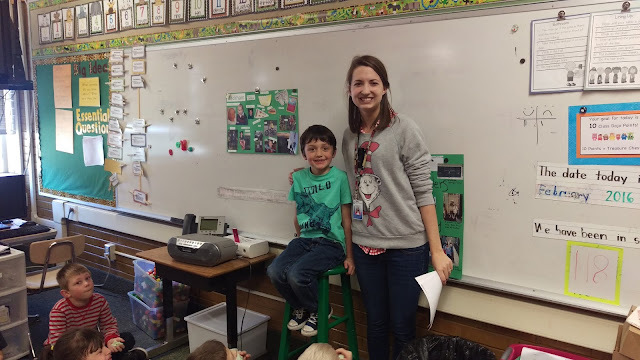 We talked about the pictures on his poster and I read a Dr. Seuss book, "I Can Lick 30 Tigers", to the class. 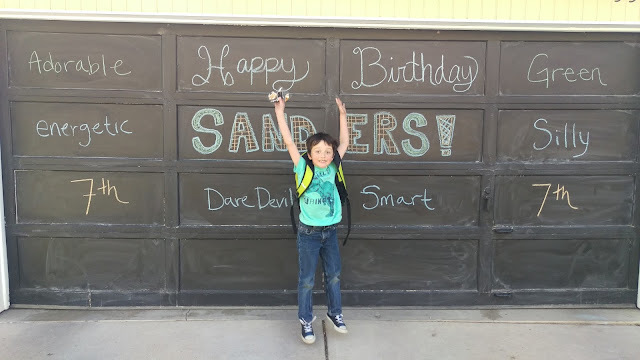 He shares his birthday with the author. School has been an emotional roller coaster this year. I was very grateful to help him have a happy day there. 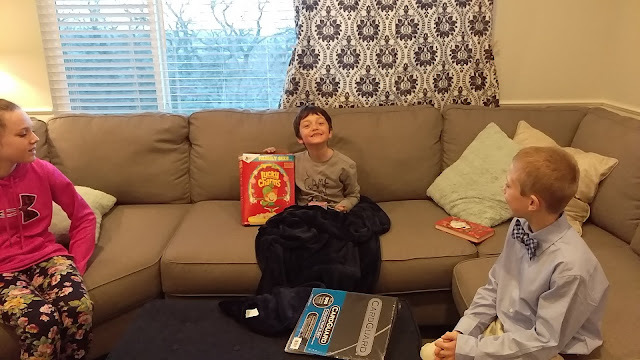 For his birthday breakfast he wanted the cereal Lucky Charms. I love it when my kids make it easy to please them. 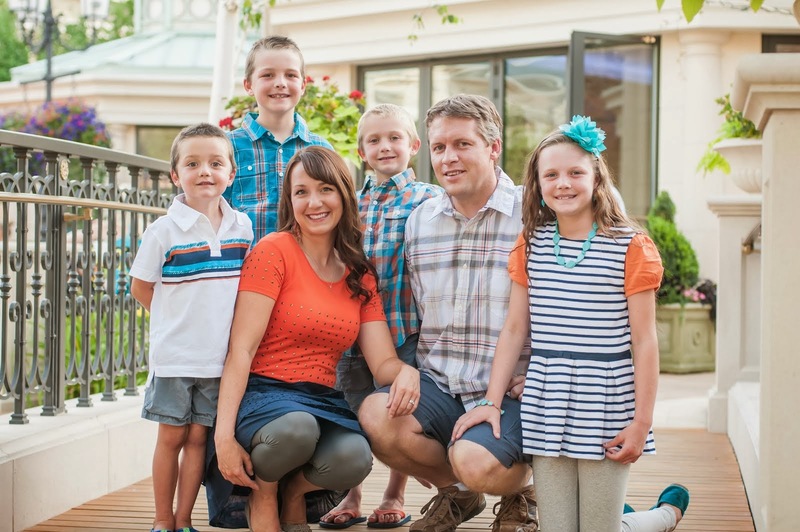 Our family isn't perfect, but they are perfect for me. Sometimes, in the still moments, after the chaos of the day has settled, my heart nearly bursts in gratitude that I get to raise these amazing humans. We're changing and growing. This might be my favorite stage yet. Happy Birthday Sand-man. We love you! I found another little gem in my emails from March 2007. 16. Favorite brand of clothing? It depends on who has the best sales! 18. What was your most recent memorable birthday? #27...I can't remember any others..sad. 22. Person you expect to send it back first? ? 28. Any new and exciting news you'd like to share with us? Karaia got her hearing aid AND Kevin only has 8 more wks until he graduates!!! 42. Do you like the person who sent this to you? Of course!! 53. What is under your bed? Kevin's firearm, sheets, clothes, and a jumper for a baby and....yup I think that covers it. I found this email as I was cleaning my inbox of OVER 5,000! Sheesh. I don't think I believed in deleting or putting things into folders in my early days of gmail. Now that's the first thing I teach my kids! Anyway. This email was to all of Kevin's female cousins' wives, his grandma Janice, and Lyndi. So basically anyone from that side of the family that didn't live close. It was sent 02/06/07. I was pregnant with Tennyson.I'm also going to include the responses to the email. The pictures below were also attached. Enjoy! Since we don't see each other that often, I'm taking a page from Katie's book and sharing our news through email. I hope we can see each other soon! Buzzlightyear The Robot Daly. Kevin and I currently have no favorites. Or even a list for that matter. And on Jan 13th we bought a van. 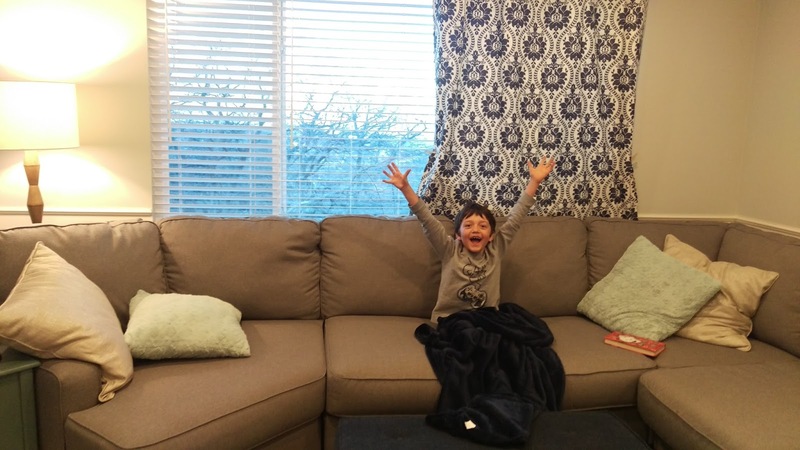 WeLOVE the extra room and that we can transport more than just our little family now. 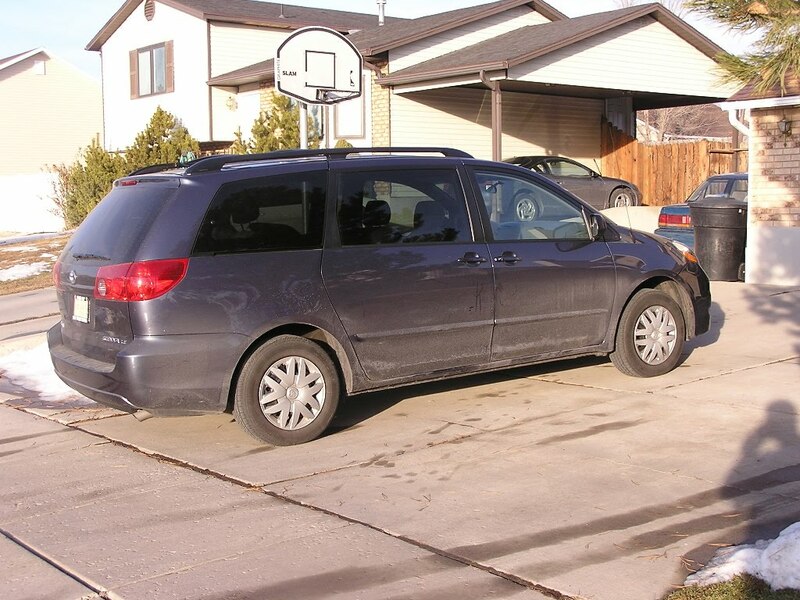 We bought a new 2006 Toyota Sienna. In Jan. we also took a trip to Bear Lake (in our new van with the extra room) and we went snowmobiling (no Emilie did not go) and extreme sledding. Karaia loved both and Beckham's pretty sure making a child participate in those kinds of activities can be categorized as abuse. The "hill" was about 1/4 mile long and VERY steep and fast. Karaia could not get enough of it. 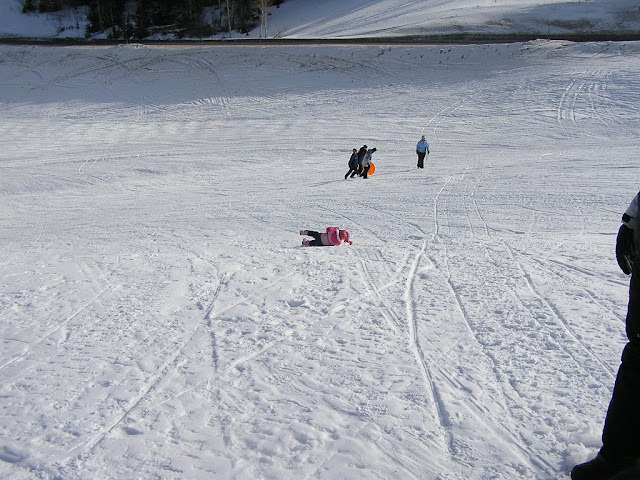 "I just like to scream on the way down", she told us. Beckham wouldn't even SIT on the sled...... even while it wasn't moving. 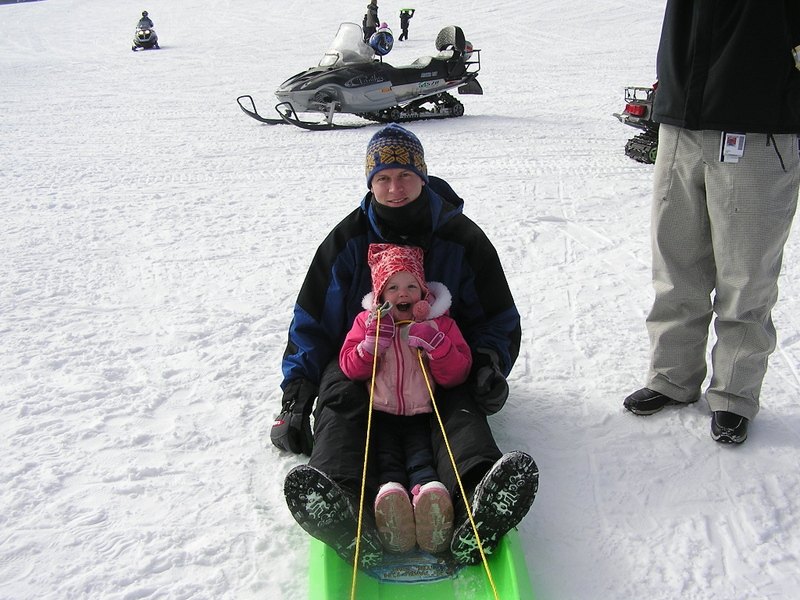 Emilie finally put him on the sled kicking and screaming and just pulled him around awhile. 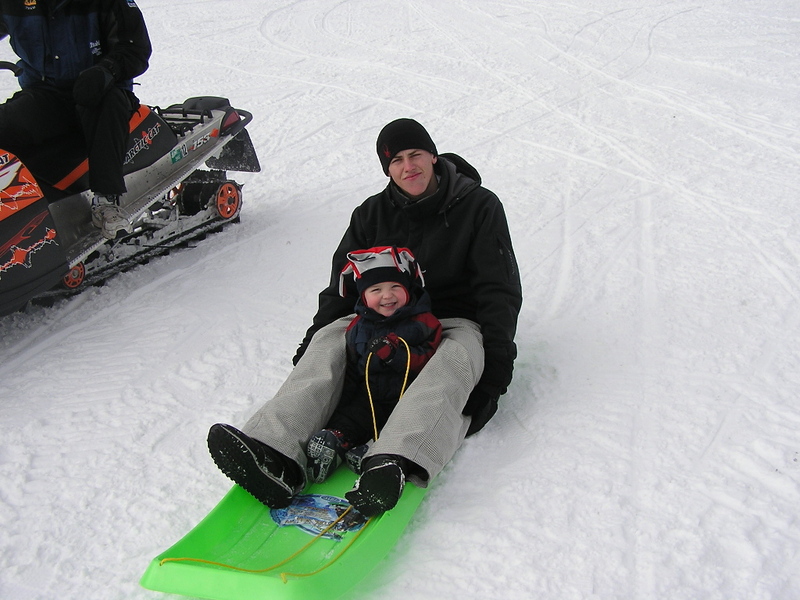 He did eventually warm up to snowmobiling. And when we asked him later what his favorite part of the day was he said, "The snowman building ride". Speaking of funny things our kids say. Karaia was asking about baptism and she wanted to know if you got baptised with your clothes on because you go in the water. We told her yes, and explained how they are white because they symbolize being clean. Then Emilie said that when you come up out of the water all of your sins and mistakes are washed away. Karaia asked, "Do they go to the bottom?". To which Emilie explained, "No, you can't see them. It's kind of like a metaphor." There was a long pause from Karaia after which she finally announced, "Mom, I think you're speaking Spanish." Beckham's been learning what letters words start with and had quite the amusing if not confusing conversation with Kevin. Beckham : "B is for me!" Kevin: "I thought M was for me." Beckham: "No, M is for mommy. D is for you!" Kevin: "I thought Y was for you." Beckham: "No! B is for me!" kade and i laughed so hard at beckham and kevins conversation, classic! Hi Emilie--I laughed out loud at your email. Thanks for sending it to me. We just bought a van too. I keep telling myself over and over, "I can still be cool and drive a van!" I have really been feeling like the very worst memory keeper of all. So this is an attempt to document at least this one thing, that I think Beckham will want to know later. 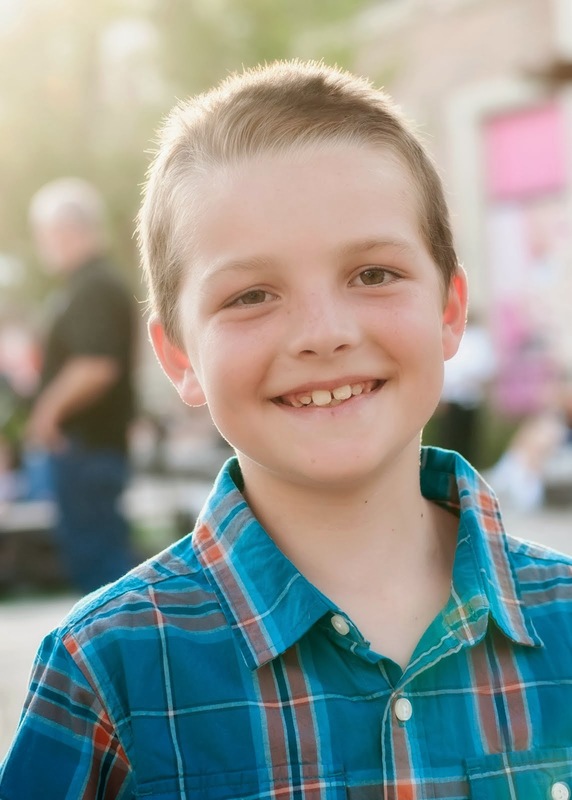 Today, Beckham officially finished and passed all his requirements for 5th grade math in the Think Through Math program and will now start on 6th grade math. Go Beckham! He's worked really hard for this achievement and we are so happy for him that he accomplished it. 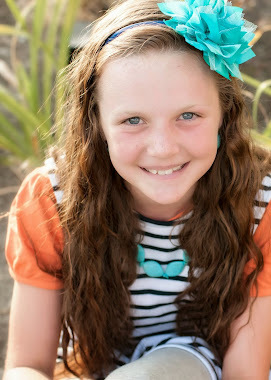 "Beckham has finished the 5th Grade material on Think Through Math and will now be working on 6th Grade stuff. Yay! I am so proud of him! 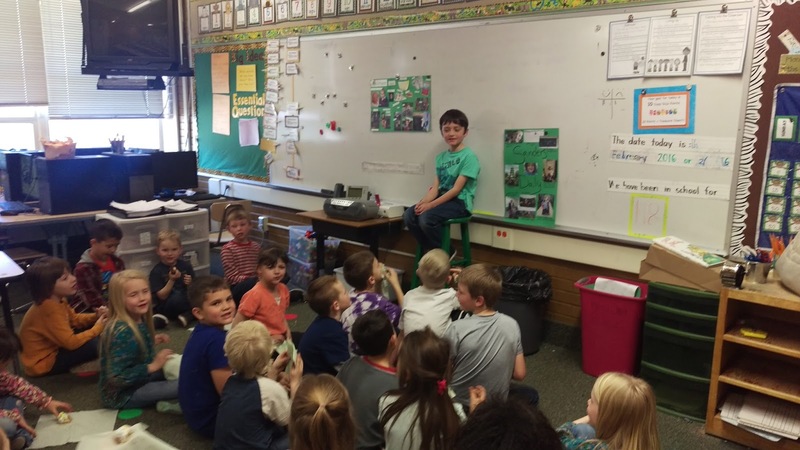 He is such an amazing kid, I love having him in my class! 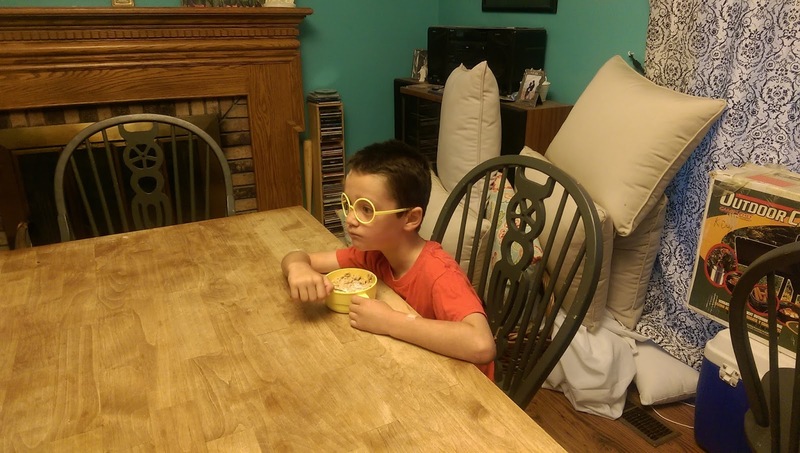 Elementary school has been a challenge for him in that he can't always progress as quickly as he'd like. This is fine with Kevin and me because we realized that he only has these short years to be a kid. 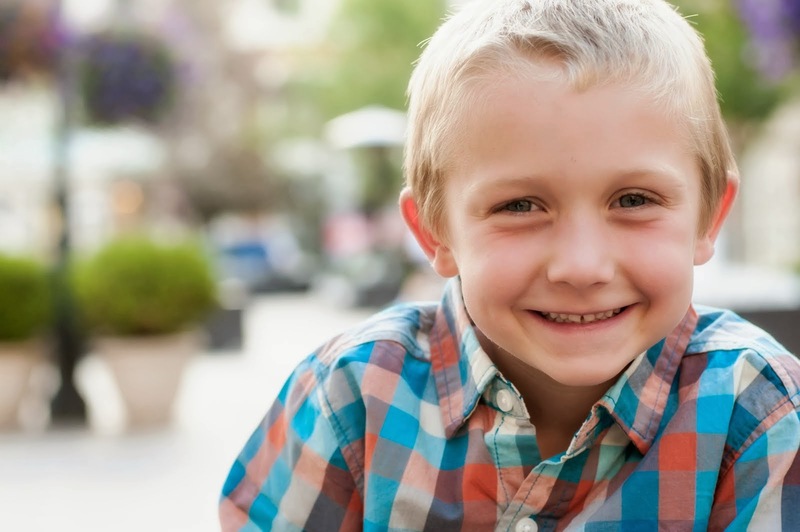 The majority of his life will be spent on being an adult and excelling as fast as possible. We've promised him that in Jr. High we will help him navigate any barriers he might encounter that impedes forward progress. 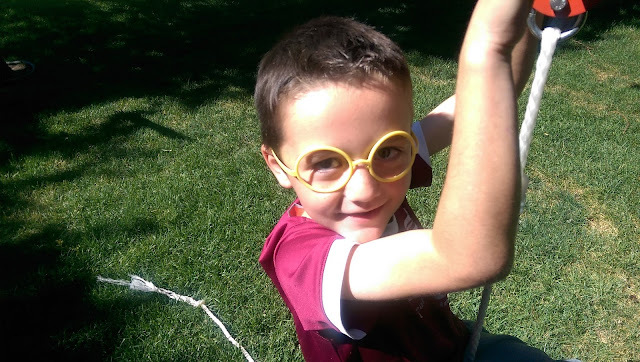 But for now, we are happy it's mostly social learning for him (heaven knows that social learning is such an asset in real quality of life situations) with a few academic cherries he's been able to work for sprinkled in. I'm excited to see where he goes once the gates are open and he can run as fast and as far as possible. Love that kid. 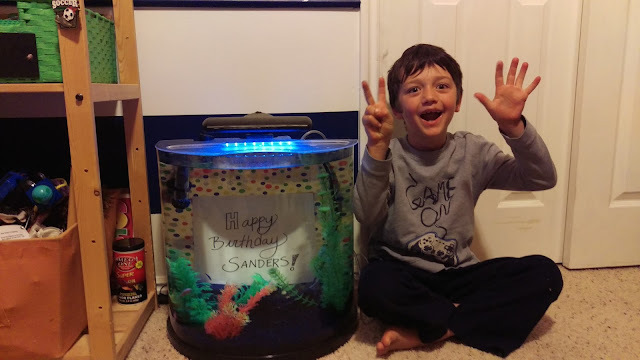 Sanders has been friends with Sonja from nearly the second he was born. They are only two weeks apart. She being the older one. Last year, whenever anyone asked Sanders or Sonja if they were going to get married, they both would basically say, "Duh! Obviously." Sonja even gave Sanders a darling framed picture of the two of them for his birthday...all her own idea. He keeps it on his night stand and makes sure it never tips over for very long. 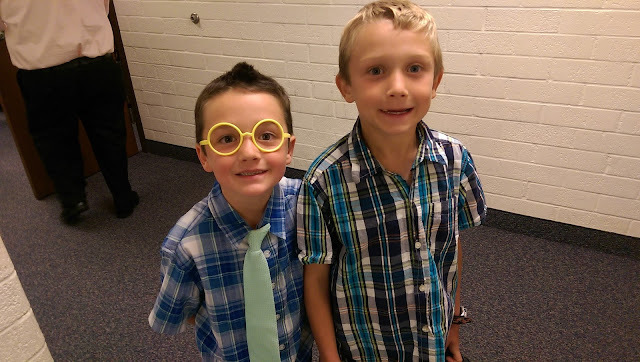 This year, well, they are in first grade. First grade is different than kindergarten in a lot of ways. The biggest social way is that they are starting to care a little more about what everyone thinks. It's a shame really, to see their innocent personalities become contained into acceptable boxes. But it also provides for some humorous insight. Sanders hasn't hung out with Sonja for awhile for a number of reasons. Curious Beckham asked him at breakfast the other day, "Sanders, do you still like Sonja?" He stopped mid-bite, turn his head so he was fully facing Beckham, and stated in all seriousness, "If you want to keep your love a secret, you don't play with each other," and then continued with his cereal. I can't wait to hear what comes out of that kid's mouth sometimes! 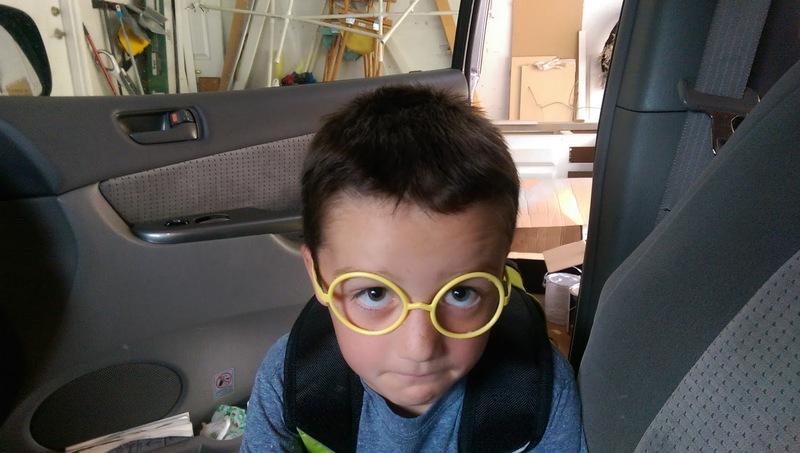 Sanders earned some plastic glasses for good behavior at school. He since getting them, he worn them all day at school and home for nearly two weeks straight. Sometimes he even sleeps in them! I asked if they were really comfortable to which he told me, "No, not really. They kind of hurt my ears." HAHAHAHA! What a great kid! 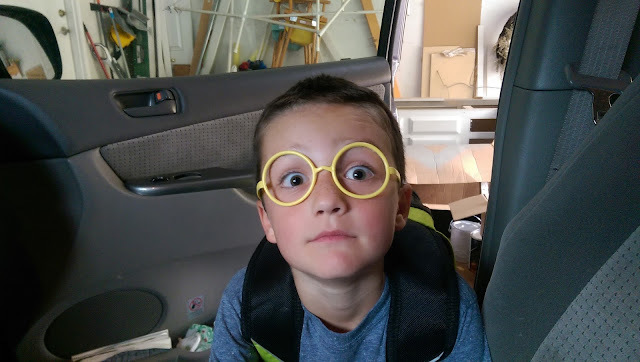 He has big plans to spray paint them black and be Harry Potter for Halloween. Too much time has gone by since I've recorded my family's journey...and they've still grown and changed. Stinkers. We are entering a new era around here and I'm feeling a bit nostalgic about the things I haven't written down. However, I can't change the past, so I'll reshape my future instead. We went to Lagoon at the end of July. 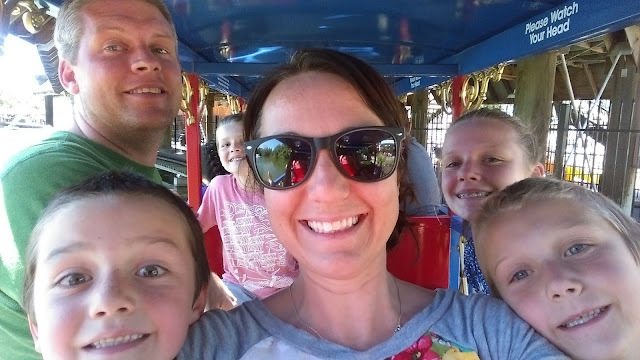 It was the first time our whole family was able to ride on just about every ride if we wanted to. It was also the first time we could send some of the kids to ride one ride while the rest of us stayed back to ride another. IT. WAS. MAGICAL. I loved it. No one whined. Everyone communicated their needs and wants like human beings. They were grateful and plain ol' fun to be around. It made me so excited for this stage. 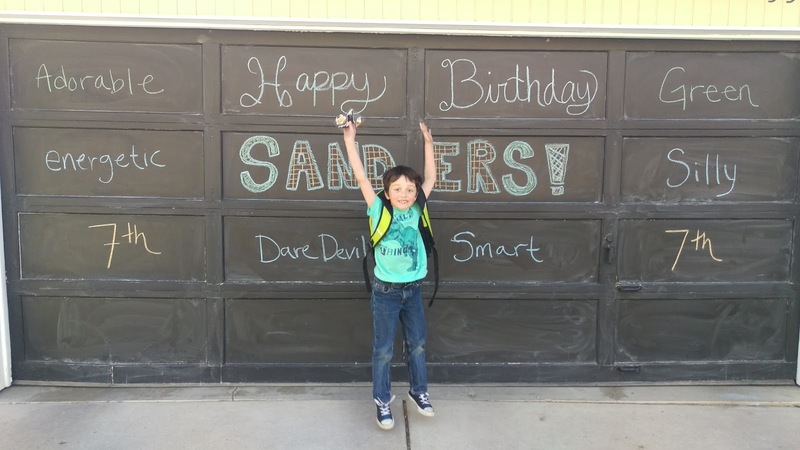 Sanders has turned into an Adrenalin junky, just like his sister. He would hardly go an any rides last year and this year he went on Cannibal at the ripe age of 6. He was in tears when he thought he might be too short and not able to ride it. Thankfully his hair topped him over ;) He thought it was the best! Tennyson, like me, has a strong sense of survival when it comes to amusement rides. He opted not to try Cannibal, but declared his favorite rides to be Wicked, Colossus, the White Roller Coaster, and Wild Mouse. Which is a far cry from refusing to go on ANY daring rides at all last year. Beckham, has learned that he traditionally feels flutters and anxiety before the big rides, but if he powers through those hurtles, he LOVES those big rides. His strong sense of mortality and his need for the rush and, to be completely honest, a good story to tell, fight with each other. He's learning to trust the statistics that most people simply do not actually die on roller coasters. It's been fun to see him work through this process and not let fear keep him from doing things he loves. Karaia is CRAZY! The bigger, the faster, the higher is all the better in her book. She reminds me a lot of her Uncle Landon who does big adrenaline rush things because 1. It sounds fun. 2. The payoff of fun is so much better than wondering what it would have been like if he'd done it. It's just not worth staying up at night wondering about that stuff I guess. Kevin loves a good roller coaster too and thankfully thinks the same amusement park rides karaia likes are pretty awesome. I went on Wicked for the first time this year. I used to be SO afraid of roller coasters and never once felt like I was missing out when I politely, but firmly, kept my feet planted to ground while others strangely rushed off smiling to be nearly killed. Something changed this year. I found myself thinking, "I could probably do that without hyperventilating". When my family rushed off to ride Colossus, I found myself sitting next to Wicked with these thoughts. Next thing I knew I was in line, BY MYSELF. Then, without any warning whatsoever, I found that I had willingly buckled my seat belt on the ride. Just as I clicked the belt, my phone started ringing. It was Kevin. My family was wondering why I wasn't predictably waiting on the ground for them. The kids joked, "What if Mom comes walking out of the Wicked exit?" To which Kevin nearly forgot how to breath because of the laughing. He has known me for 18 years and that scenario was 99.9% unlikely to EVER happen. Except it did. It was perfect. Like you'd expect to see in a movie. The kid's mouths broke out into HUGE smiles and they all rushed over with lots of whooping and screams of delight giving me big hugs and high fives. Kevin's jaw dropped and his feet became glued to the ground. Where were the prank cameras? There is no WAY this just happened. But I saw the twinkle in his stunned eyes. The kids begged me to go on it with them. So we all went, as a family, together. The beginning of the end of our time with the kids home is so bitter sweet. Can I share a small glimpse into my story? I believe, no, I've had too many confirmations for that word, I know Heavenly Father has asked me to pursue becoming a fabric designer. Why? I have yet to have the question answered. All I know is one day I woke up and out of the blue,with a physical longing, an aching, to be a fabric designer. I had no prior history or knowledge of fabric design or a desire to even learn about such things and with only a small,vague conscious awareness that there was someone who actually designed the patterns on fabric. In 2009 just before I turned 30, with this new found seemingly unreachable goal, I made a game plan. Every time I began a new decade I would choose one crazy hard to accomplish goal. I gave myself the whole decade to complete it. For my 30s, clearly, the goal would be to become a fabric designer. I wrestled with this goal a little. 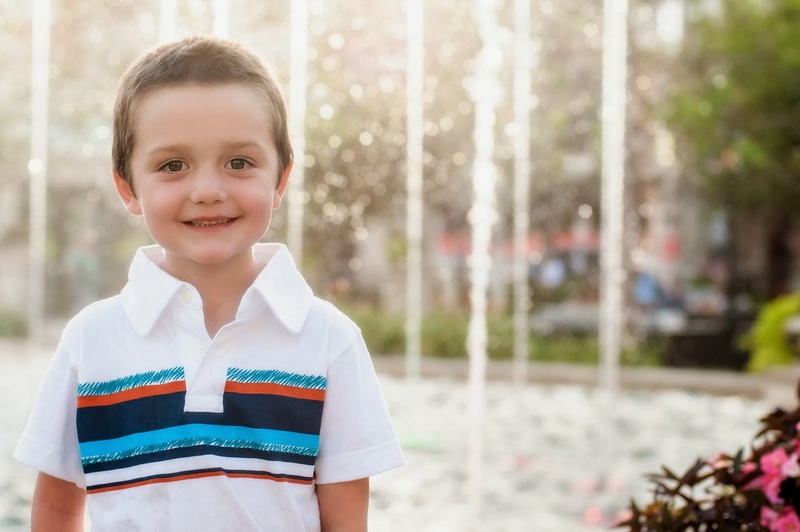 What is the world did it have to do with the eternities, with raising my young children (my youngest at the time was just over 6 months old), with returning to my Heavenly Father? And yet, I have been taught that we should use and develop our talents. That IS something that will help me attend to those other top priority items. One of my talents happens to be art. For the first week after I woke up with the new direction Heavenly Father had given me, I cried. Every night. I didn't know what I was doing. At the time there was NOTHING out on the internet to guide me. There is a ton now, but if you notice nothing published before Sept. 2009. I was shocked to realized the interwebs had failed to provide me with the information I asked for. Even the public libraries were no help. I had just started and already was failing. Have you ever been driven to do something and then, despite your very, very best efforts, you realize there is no way YOU, small little you, can make it happen? It's a rough place to be. I was expressing this misery to Kevin, my husband, when he said, "I have a friend who owns a fabric manufacturing company." I believe my words to him were, "You do not. Please don't joke about this. This is really important to me for some reason." I mean I had been crying for A WHOLE WEEK. He knew what I was crying about, I'm not really the silent sufferer type. So you can see why I thought he was fooling around. But no. He meant it. He actually does have a friend who owns a fabric manufacturing company. Riley Blake Designs no less. I was thrilled! They were local, Kevin knew them personally, I thought I was in! I thought, the intensity of the feelings I had been given were a clear indication that things were going to fall into place rapidly. Clearly, that didn't happen. In fact, they HATED my designs and told me in so many words. I was crushed. I kept it together long enough to get into my car and then I just cried and cried. However, I decided early on that, "no" did not mean, "never" it just meant, "not right now." The next few years were filled with more leads, and open doors, and tears, and many, many, MANY no's. But with each No I'd try really hard to look at it as one no closer to my yes. I believed with all my particles that there was a yes. It was out there, I just had to keep working my tail off. I kept teaching myself the computer programs I need to know like, Illustrator and Photoshop. I read anything I could get my hot little hands on that would lead me to more knowledge of how becoming a fabric designer actually happened. In September of 2010, I came across a blog, 7 Layer Studio. Shelley had just recently announced she had licensed with Benartex and was coming to SLC that spring because that's just where Quilt Market happened to be that year. Right in my backyard! I reached out to her and offered to be her minion at Market and that she could stay with me while she was here. I know it sounds crazy. I didn't even know this lady, but it felt like a door opening. At least I'd get to SEE what Market was like and I would get to help an actual, real life, designer. I'm a hard workers so I knew it could be beneficial to her as well. There's a LOT that goes into a booth. She said yes! I couldn't believe it and she couldn't believe it either. Market went great! Shelley's booth was in.cred.ible! You can see that here (May 15, 2011). She is SO talented in a lot of areas. It really is inspiring. She put me to work, we got things set up, and then I was off to walk the floor. I showed my portfolio to a great number of manufacturers. The most common response was, "we like it, but it's similar to so and so's designs that we already have signed on. But THEN I got a YES! From Paintbrush Studios. You can read all about that here (May 13, 2011). In the end, it just didn't feel right to sign on with them. It was hard to say No to a Yes. REALLY hard. It felt ungrateful and pretentious. But at the end of the day, it wasn't a good fit. The rest of the year I kept submitting work to various manufacturers I had met at Market, but had been unable to meet with them OR they had said they'd like to see more work. Benartex and I even began talking. I get SO close and then weird things would happen. With Benartex, the day I was supposed to have a final meeting with a bunch of the head people, their high rise New York building caught fire and their phone systems were out for days and days. We never made it on the same page after that. Now that I'm on the other side of it, it's weird. I remember all the hard work. I remember the tears and the sleepless nights for longing to fill this hole in my soul. But on this side it feel like, "well, of course it had to be like that." I'm finding, in my old age, many trials end up feeling that way on the other side. I am beyond grateful that this is part of my story. This is part of the legacy I will leave my children. That big dreams CAN come true with a lot of hard work. It won't be easy and I'm grateful for that too. I hope they reach. I hope they shoot for something they might fail at. I hope they even fail a little along the way, but learn to use the "No" as the next step up to reach the "Yes". I hope working for it brings them fire in their hearts, sleepless night of longing, and sends electricity through their bodies. Everyone should have a chance to feel that at least once. Hi! I'm Emilie. When I turned 30 I decided I needed to have a new scare-me-spitless goal every decade.A dream that seems impossible at first, but that I felt really drawn to. The dream this decade is to become a fabric designer. It's been a terrifying, thrilling, exciting journey. One little step at a time. In 2012 I realized this dream and signed a contract! Besides this passion, I somehow have kept alive my four crazy, funny, kids and my very supportive husband. I currently work at HowDoesShe.com as an Instagram Coordinator and LOVE any chance to learn a new skill. Organized A to Z Blog has a new home!